As many of you know, we enjoy assisting small business owners in developing countries through the microlending website Kiva (www.kiva.org). It’s one way that regular everyday people like us can band together to fight global poverty by helping others to work toward making their businesses flourish, which helps them lift themselves and their families out of poverty, thereby making a positive impact on their communities and strengthening their local and regional economies. So here’s how microlending through Kiva works: The non-profit organization Kiva partners with microfinance institutions who disburse the loans and act as Kiva’s “Field Partners” in each country, finding and gathering information about business owners. Then the volunteer Translators and Editors (one of whom is your very own Innkeeper Brigette) do their work — translating loans into English, checking for grammar and readability, making sure loan information matches up and the photos of the business owners are clear — and send the descriptions on their way to get posted to the website, where lenders from all over the globe can browse and find a business owner to help. What we like about Kiva is that it’s more of an empowerment tool than a handout or charity. Lenders choose their borrower, lend anywhere from $25 up to the amount of the loan, and Kiva disburses the funds to the Field Partner to replenish the loan made to the borrower. The borrower pays back the loan over time, the funds are returned to Kiva and Kiva repays the lenders, who can then reloan the money to a new entrepreneur, make a donation to Kiva or retrieve their money. Rohullamen, 33, is married and supports his entire family (wife, parents and three siblings). He’s committed to growing the general store that he owns so that he can send his younger brothers and sister to school, where they can get an education and become successful, too. We appreciate that determination and bright, positive outlook on the future, especially given the fragile state of Afghanistan and since it wasn’t too long ago that Rohullamen’s sister would not be able to go to school at all because she’s a girl. 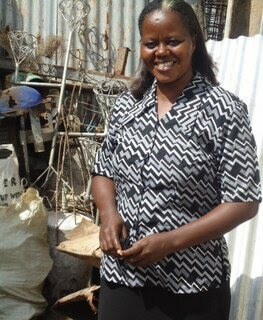 Since we had enough in our “Kiva bank”, as we call it, to lend to a new entrepreneur this week, we headed out to the Kiva website and found Kivelyo (pictured above), a single woman in Kenya, who used to sell secondhand clothes until deciding to start a scrap metal business on her own. Kivelyo not only faces the challenge of being a woman business owner in a developing country, but also has to deal with thieves. Undeterred by these obstacles, she obtained a loan to expand her business, which includes hiring unskilled laborers. We, along with 36 other lenders from San Francisco to Switzerland financed the loan. We like that Kivelyo is forward thinking when it comes to her business goals — she hopes to open up her own shop one day. We hope she’s able to do that and wish her the best!